I attended the BIO International Convention April 21-25, 2013 at McCormick Place in Chicago, Illinois. The University of Notre Dame is a BIO member company and a 2013 exhibitor. I volunteered for two days and received two day passes for the convention. During my volunteer sessions on Monday and Tuesday, I worked in the Sponsor Lounge where I was able to interact with members of large international biotech companies. I was able to participate in the convention on Wednesday and Thursday. It was a great opportunity to visit the exhibits and speak with professionals in the biotech and law fields. Some of the exhibitors were representatives of law firms that practice in the field of intellectual property law. I spoke with patent attorneys and agents from many law firms including Thompson Coburn LLP, Barnes & Thornburg LLP, Frommer, Lawrence & Haug LLP, Foley Hoag LLP, and McDonnell Boehnen Hulbert & Berghoff LLP. The convention also featured major biotechnology companies. Participants included Astellas, Janssen Pharmaceutical Companies of Johnson & Johnson, AstraZeneca, Genentech, Merck, and GlaxoSmithKline. I really enjoyed meeting domestic and international professionals in my field. Besides the individual exhibitors, there were separate pavilions for each country and some states of the US. Each country pavilion had details about the particular country and business information. During a reception on Tuesday, each pavilion contributed to the festivities. The Switzerland pavilion provided a chocolate fondue with fresh fruit and cookies. The Belgium pavilion provided fancy coffee served by a barista. My favorite pavilion was the France pavilion which provided cheese and wine to attendees and where French was spoken almost solely. 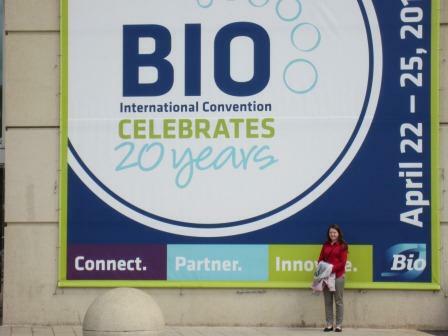 The BIO International Convention was a great opportunity both professionally and academically. Attendance significantly impacted the drafting of my thesis and my professional development. The BIO International Convention was an exciting event that provided a lot of valuable information and insight into intellectual property law, pharmaceutical development, and marketing strategies. Legal professionals are often required to bill their time in the form of timesheets. The particular minute increments for billing are dictated by employer policies. Some common time increments are 6, 10, or 15 minutes. Each independent activity should be separately itemized with a corresponding time. Timekeeping is necessary for accurate client invoices. Time may be recorded on a spreadsheet for convenience. Complete sentences should be used with sentence case and periods. The sentences should be written actively, distinctly demonstrating the work that was performed for the client. Examples of action verbs for billing time include researching, analyzing, drafting, and revising. The tasks should be described and supplemented with specific details. However, the description should not be so long that the task seems ambiguous. Although the tasks should be described in a legal and knowledgeable manner, the descriptions should be understandable to the average client. It is important to bill time because clients may examine the legal bills with scrutiny. Every minute billed to a client must be must be clear to avoid dispute. The task descriptions should be specific to the individual client to aid in comprehension. For example, instead of describing a task as “drafting amendment”, the description could be improved by identifying the patent application number and including details about the type and nature of the amendment. Slang and abbreviations should be avoided because the timesheets may be reviewed by individuals unfamiliar with a particular terminology. In the MSPL program, we bill time for every assignment to practice legal billing. We learned that is beneficial to bill time while working on a project or as soon as possible after completion to avoid mistakes and errors. The ability to produce detailed and accurate timesheets is a fundamentally essential skill for a successful career in the legal field. Priority application deadline is approaching! If the MS in Patent Law is an option for you, make sure your completed application* is submitted by April 30, 2013! All applications submitted by that date will be considered for one of four scholarships next year. We have two $5000 scholarships made available by the gift of agenerous Notre Dame alumnus. These scholarships are available to EE or ME graduates, and will be awarded to students with demonstrated financial need. We have two additional $5000 scholarships available to students who are interested in blogging for the MSPL. These scholarships are open to any applicant. All completed applications* will be considered for these scholarships. If you are one of the finalists, we’ll notify you directly. *Completed applications include informal transcripts, GRE/LSAT scores, and all required personal statements. Letters of reference are NOT required for consideration for these scholarships, although they are required for the final application to the program. We’re winding down the year here at the MSPL, and have some exciting news to share: two of our students have already taken and passed the patent bar exam! They are on their way to becoming registered patent agents!! Congratulations! The job outlook is also bright for our graduates: two of our students already have jobs, and everyone else has had at least one interview for a job as a patent agent or a technical specialist! I couldn’t be more proud. It’s been a great first year, and I’m so excited to have been a part of it. I wish all of our graduates the best of luck as they start their careers in the patent world!